Picture yourself walking down a quiet and dark alley next to a nondescript building on the southwest side of Fort Wayne. You open a door to find a roomful of rowdy party-goers. Two old Wulitzer jukeboxes decorate the corners of the room and on stage are four musicians. The dance floor is packed. It is the height of the disco era, and a live band is a rarity. But these musicians have the crowd reved-up by playing straight ahead, full tilt, party rock n’ roll! It’s been over 30 years since this group of musicians first began entertaining Fort Wayne party-goers at Pelz Reception Hall, which was located next to a salvage yard. 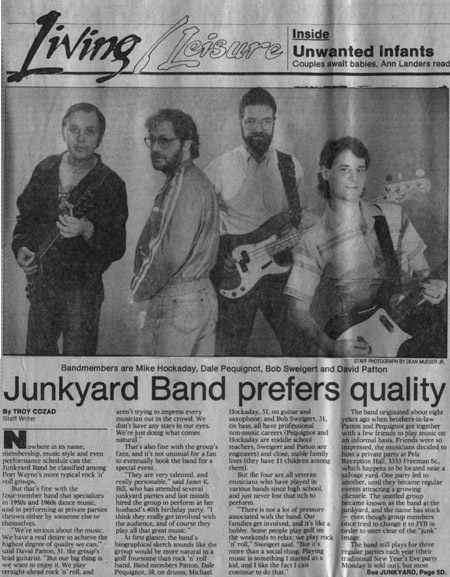 (Hence, the name Junk Yard Band.) 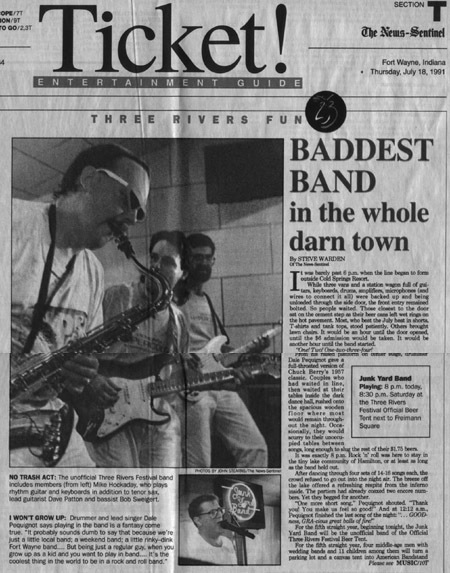 Lead vocalist and drummer Dale Pequignot, his brother-in-law and lead guitarist Dave Patton, along with Mike Hockaday, the band’s “hardest workin’ man” playing guitar, keyboards, bass, and saxaphone, were the JYB charter members. Various musicians played with Dale, Dave, and Mike in the formative stages, but when Bob Sweigert came on board, the stage was set. The Junk Yard Band soon found themselves in demand at area dances and fund raisers. JYB was quickly adopted by street rodders and custom car enthusiasts. The annual Muddy River Run pool party became a party classic. Soon JYB was hitting the road to play the Wide World of Wheels at the Indianapolis Hoosier Dome Convention Center and traveling even further south to Brown County for the annual Cider Run. With the growth of the band, equipment manager and lighting tech Jim Robison joined the JYB organization in 1986. In 1993, Don Miles took over the drumming chores, allowing Dale to concentrate on the lead vocals. Rounding out JYB is lead guitarist Greg Reszel and Rick Brown on sax, keys and guitar. The Junk Yard Band has been a fixture at Fort Wayne area parties, dances, fund raisers, festivals, and custom car shows. 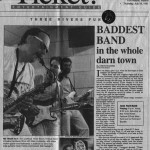 JYBheadlined at Piere’s as that club evolved into one of the mid-west’s most prominent concert venues. JYBwas the featured act at WAJI Majic 95’s Fort Wayne Bicentennial New Year’s Eve party. 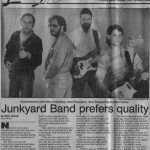 The Junk Yard Band is the only local band to entertain Three Rivers Festival-goers for 10 straight years. JYB has been a TRF Festival headliner, sometimes twice during the festival week, and has opened for national touring acts. The Junk Yard Band has had a 15 year association with the James Dean Festival, playing the Rebel Run and the official James Dean Memorial Rod Run in Fairmount, IN. JYB has played every June, July, and August for the last 9 years at Cold Springs, the legendary summertime dance hall at Hamilton Lake, IN. And the Junk Yard Band continues to ROCK ON! A full playing schedule is testimony to JYB’s popularity and staying power. Computers, lighting, and a diverse Classic Rock and Oldies play-list are all part of today’s Junk Yard Band as the group strives to give their faithful followers what they’ve come to expect with each new gig. 1985 – Released extended-play record album of original songs: HOT SHOTS. 1987 – Featured on WXKE’s record album: FORT WAYNE ROCKS – Vol. 2. 1990’s – Performed long running radio commercial for Tom Steele Tires. The JunkYard Band has shared the stage with The Platters, Three Dog Night, Jefferson Starship, The Guess Who, Phil Dirt and the Dozers, the Classic Rock All-Stars, and have been invited to open for Chubby Checker. Contact us now for booking information. All content Copyright © 2015 Junk Yard Band, Inc.